“I’ve never read Jane Austen! 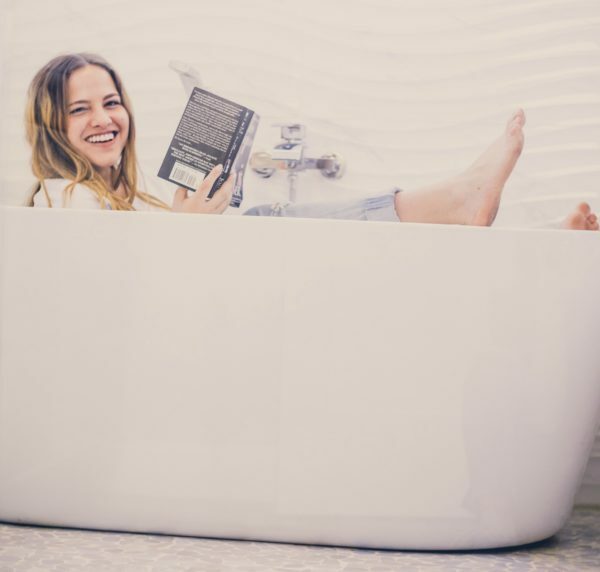 Which one should I start with?” As an obsessed Janeite, this is definitely one of the most frequently asked questions I get. The last three novels I listed are Austen’s more melancholy works and I think they’re best appreciated after tackling her more light-hearted novels. That’s not to say that there aren’t serious themes in the first three I listed, but the last three have a very different feel. I think the biggest pitfall when beginning Austen (especially if you’re not in the habit of reading classics with more antiquated style and language) is to miss the HUMOR. Austen is funny. And if you can’t recognize the humor, you miss out. Pride and Prejudice is the perfect novel to begin with because it’s so accessible, and the hilarity comes across clearly even to modern readers. Mansfield Park’s Mr. Rushworth has me in stitches every time, but if I’d read MP first, would I have picked up on it? Perhaps not. So start with P&P. It’s practically perfect in every way. You will laugh out loud. You will fall in love. It will be glorious. Emma is a great follow-up to P&P. While Elizabeth Bennet’s flaws can be endearing, Emma has haters. She’s a very different kind of protagonist and many find her hard to love. I have a lot in common with Emma (which is why I hated to sort her into Slytherin, but it had to be). But it can’t be denied that she has a lot of maturing to do in the novel. In P&P things are happening to the Bennet family, but in Emma, Emma is calling many of the shots (with disastrous results). It’s a funny novel with lovable townspeople (a must!) and arguably THE BEST Austen hero of them all–Mr. Knightley. And by arguably, I mean, I will argue with anyone who disagrees with me on this. I’ve placed Northanger Abbey after P&P and Emma, but before the more serious novels because while it’s comical and light-hearted, it’s in many ways the odd one out. Unlike the other novels, this one is a parody of gothic romances. It’s delightful and charming, but due to the fact that it’s a parody, it’s just not on the same level as the other novels. I think most people should read NA after falling in love with Austen. But don’t read it last because it would be a little bit of a letdown after the other novels! Caveat: Catherine Morland, the protagonist, is seventeen and such a teenage girl. If you’re trying to introduce Austen to a younger audience, NA might be a fun way to begin. But some understanding of gothic novels is a must before beginning, otherwise the jokes won’t be as funny! And so much of the plot would just seem….weird. How I love this one! Sometimes I think it’s my favorite of all. 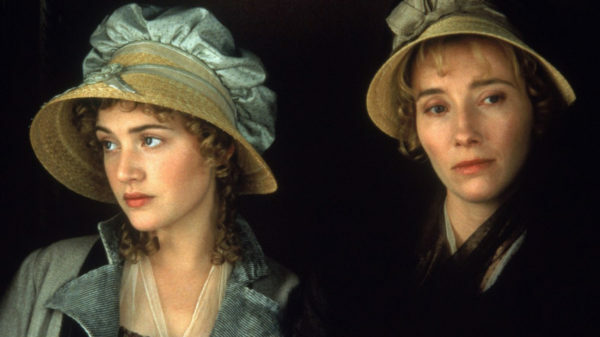 In some ways, Sense and Sensibility is a sister novel to P&P. The plot is a little bit similar (two sisters in financial distress and in need of good marriages), but it’s carried out in a way that’s all its own. 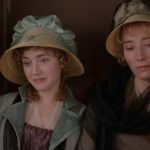 Elinor and Marianna are very different characters from P&P‘s Elizabeth and Jane and their situation feels more tragic. S&S is more dramatic (seduction! Almost dying of a broken heart!) than the first three novels on the list. It’s the perfect gateway book into the second half of the list. This one is a strong competitor against Northanger Abbey for the Odd One Out Award. This one is brilliant, but I wouldn’t recommend starting your Austen journey with Mansfield Park. And you might not want it to end with it because it’s such a melancholy book. I ended the list with Persuasion because it feels the most mature of all JA’s works and your reading of Austen will really end with a bang if you read it last. The protagonist, Anne Elliot, is older than any of the other heroines and the book has very autumnal themes. Anne’s not in the springtime of her life. She’s older, wiser, more mature, and has learned to be resigned to terrible disappointment. Her grace and strength make her one of the finest of Austen’s heroines. There’s not as much humor in Persuasion. Even the more comical situations (Anne’s father and sister Elizabeth’s vanity and her sister Mary’s hypochondriac tendencies) are so sad that they’re harder to laugh at than say, Mr. Rushworth or Mrs. Jennings. But the characters are splendid and the plot is so satisfying! So there you have it: the best way to introduce yourself to Miss Austen. But honestly, just promise me you’ll read them all. I’m not picky about the order. 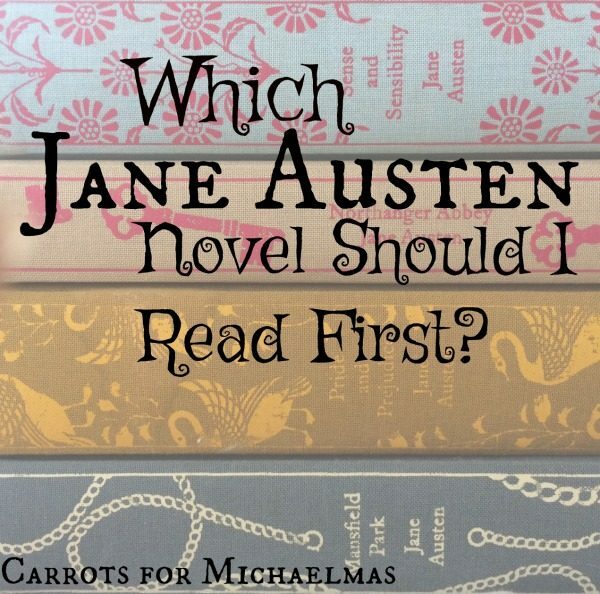 Do you think there’s one novel that’s best for Austen newbies? Agree or disagree with my list? Let’s chat in the comments! Psst! Want more guidance about books that are good for the soul? I gotcha covered with this little labor of love that I put together for fellow bibliophiles! 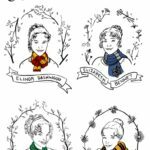 Printable pages of book checklists with extra blanks for adding in your own favorites! 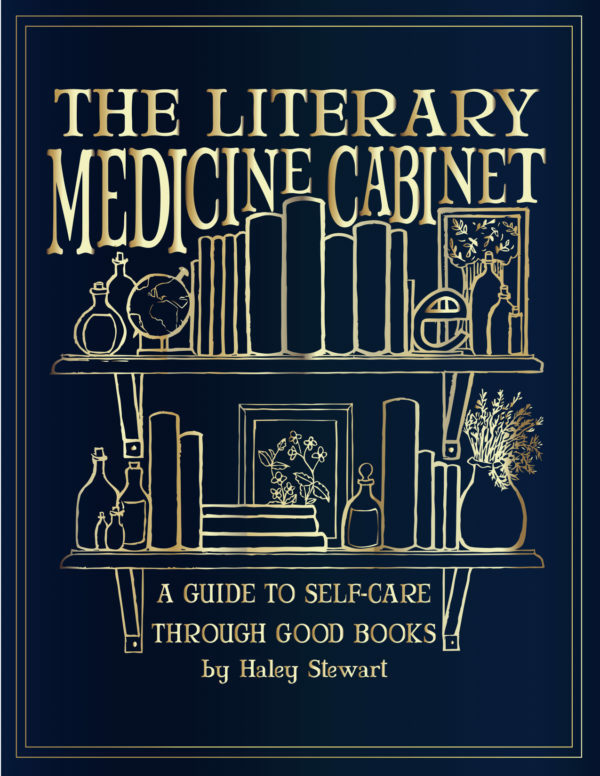 Ready to crack open your copy of The Literary Medicine Cabinet and get started on some bookish self-care? Grab your copy for $7.99 and brew a delightful cup of tea! 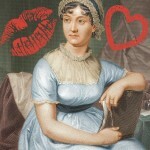 Why Do We Still Love Jane Austen? I must agree wholeheartedly with your way – the right way, of course. I always recommend that exact order: comedies before tragedies. 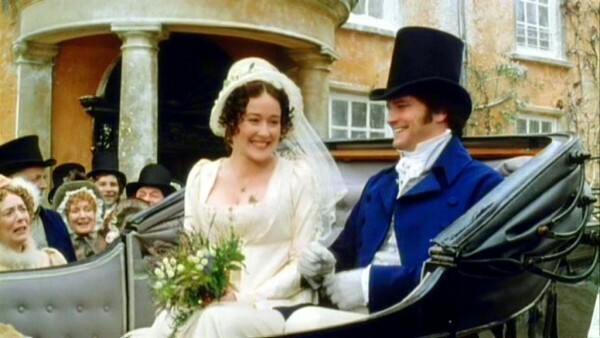 Even though Austen’s books always have happy endings, S&S, Persuasion and MP are very much tragic, not so much in plot but in that feeling of melancholy throughout the story. Even the villains and their endings are tragic and sad (think Willoughby) unlike the “funny” villains (think Mrs. Elliot). Yes! It’s the whole FEEL and tone of the S&S, Persuasion, and MP. Thank you for this. (I HAVE read several of Miss Austen’s books and remember enjoying them). Now approaching I am bereft finding I could not read them with any pleasure. I now feel that I will enjoy reading/rereading them! I was going to argue about where you put NA but then I just realized that I don’t really like NA and nowhere would make me satisfied! Maybe I should give it another try. I think I’ve read it twice, but not since college. I read it second and didn’t like it. ? I’m with you ladies. I think I would like it if it was the only novel of Jane’s I’d ever read. But since I love the other five novels so much, it’s always a little dissatisfying. I get annoyed with Catherine. My English lecturer at University insisted that one should never read NA unless they did so aloud. It’s funny read to someone else. Otherwise it’s forgettable. You present me with a dilemma : the only two I’ve never read are NA and MP so I must end with one. I vote NA then MP, because NA sillier and MP really more whole and brilliant of a novel. Same! I vote NA as a warmup and then MP. I read S&S first, when my grandmother gave it to me at 12 (I was a very bookish, classical lit sort of teenage girl, and was in the midst of a Dickens phase at the time). I really enjoyed S&S, but subsequently fell in love with P&P, which I read next. I don’t recall the order in which I devoured the others (including Lady Susan, Love & Marriage and the unfinished Sanditon), but read them all I did! Yes, Emma is the only book I just can’t seem to get all the way through. I absolutely agree with this order! I came to your blog the a couple of weeks ago looking for exactly this list, lol. Thanks! This is a great order. I happened to read them originally (at 11-15 yrs!) in a similar order but a bit mixed: p&p, s&s, emma, mp, na, persuasion. And that’s a pretty good order, too. I personally, thought MP was hilarious and brilliant, but I think I was primed by reading s&s and p&p…and i agree with “save the best for last” with persuasion! And don’t forget lady susan! I’m still ticked that the recent movie version flipped the title with Love and Friendship, but otherwise it was a pretty great adaptation. Such a fun movie! I haven’t read the book, so that’s on my list! This is a great order to start with! Another good reason for PP being first is that the story is so familiar — most people know the basic plot even if they haven’t read it yet, so I’ve found that that helps people get the hang of the 19th century language without getting lost or confused. I was intrigued by this post because – shock horror – I’ve only tried to read P&P, and I gave up about 100 pages in because I just couldn’t get into it ??? but I want to try again because so many people whose literary taste I trust love it. So I have a slightly different question – do you have any tips about *how* to read it to get the most out of it? I would try listening to it as an audiobook. The reason will probably highlight the humor and you might be able to get into it. Try Karen Savage’s reading on Librivox (free!). Knightley is THE BEST. And I have a soft spot for Elinor, too. SO i’m late (very late) to the Austen party, but I began with P&P last year and was about to move onto….. Thank you SO MUCH for sharing that article. I was fascinated! Alright, alright! I give in! I’m finally reading Pride and Prejudice, my FIRST Jane Austen read. I somehow avoided it in high school (not that it wasn’t assigned) and dug out that old copy…amazing I still have it after all these years. Clearly it was meant to be. Persuasion is my favorite of all of the Austen novels. It is so sweet and so sad and it is reasonably quick and easy to read. It’s definitely up there for me! I’d like to recommend David Shapard’s Annotated Austen series. Especially to the newbies! I read Pride and Prejudice and did not understand it. Or maybe I thought I understood at the time and then I read Shapard’s edition and that’s when I realized that I never really read it the first time because I didn’t know anything about British life in the early 1800’s. He provides annotations FOR EVERY PAGE! And when you look at the books (twice their size due to the notes), one might think “How could that be enjoyable? 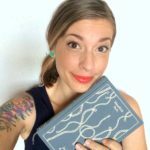 !” Let me tell you – his annotations open up a whole world of British life that not only aids the reader in the enjoyment of Jane Austen, but actually teaches one about history. I even understood Downton Abbey (set about 100 years later than Austen’s stories) better! So do not delay – esp if you’re like me who desperately wanted to get into Jane Austen but could not – get thyself the Annotes editions! Kindle has them too – very easy to access the footnotes. There are five editions out now; Mansfield Park is his last endeavor and will be out in April 2017! Am quite excited. Oh I’m so excited to check these out! The order in which they were published! I read S&S first when I was about 14 and looooved it. Northanger Abbey is weird and you need to be fully on board with Austen in order to get it. When I set out to read them all, I usually read them in that order. It’s fun to follow the themes. I read Sense & Sensibility first…with the aim of then watching the film to drool over Alan Rickman (have to read the book first, you know). I loved it – the book, that is, haven’t actually seen the movie yet. I have a question. Our homeschool coop uses the Seton curriculum, and I’m responsible for senior English. Any tips on teaching Pride and Prejudice to boys? Hey Erin! You’re question about teaching Pride and Prejudice to boys reminded me of these articles from Verily — both are on learning about relationships through Pride and Prejudice and written by a guy. Maybe not at all what you need, but maybe they could be an interesting starting point, so I thought I’d pass them along anyway! I have not problems with your list – but request a further refinement. I am considering which book to introduce my college-aged kids to and the problem is that they are very familiar with the P&P movie. So I thought they should read a different story than one they already know. They also know the Emma story from Clueless and think the saw the Paltrow movie too. However, might their introduction to her writing be enhanced by already knowing the story so they can focus on the language? I have read and loved P&P and S&S before and always meant to read the rest of Austen’s work, but haven’t. I like this list because it spaces out what’s familiar to me with what isn’t, and I’ll be following it through the rest of this year. Eager to start Emma tonight.